When we got to Cousin Barb’s house Tuesday evening, she brought out a fantastic photo album that had been our Grandmother’s. We pored over an amazing collection of randomly organized family photos. Pictures from when we were little. Glamorous shots of our mothers and their sister when they were in their 20s. Pictures of grandparents and aunts and uncles and unlabeled friends’ weddings and babies. Most were unidentified and rather than being organized chronologically it appeared to be a case of, here’s a page where there is room for this photo. There was a picture of our grandmother as a young woman, between school pictures of my sister and me that I hope Barb will have sympathy to burn. 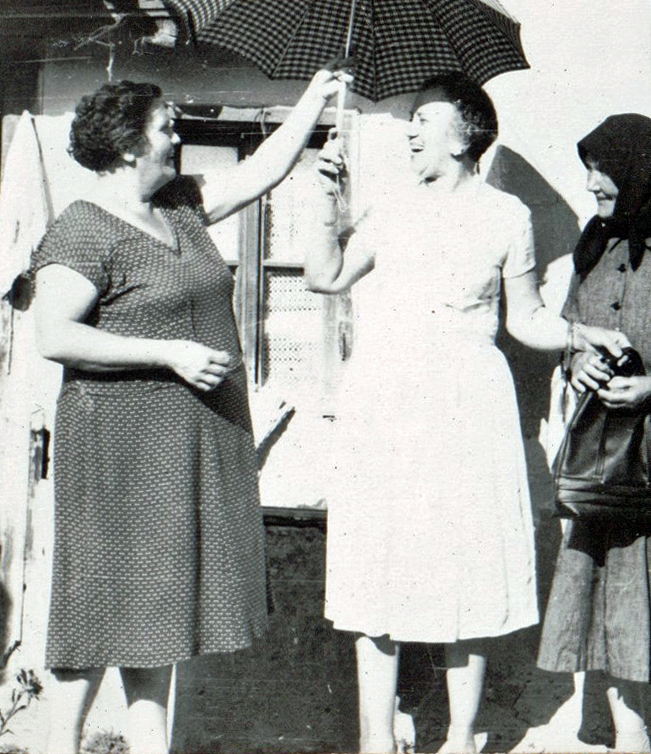 The pictures show our grandmother Erzsébet in 1961 visiting her mother Borbála (Barbara) back home in Székelykeresztúr for the first time in 33 years. This sequence was one of my favorites. 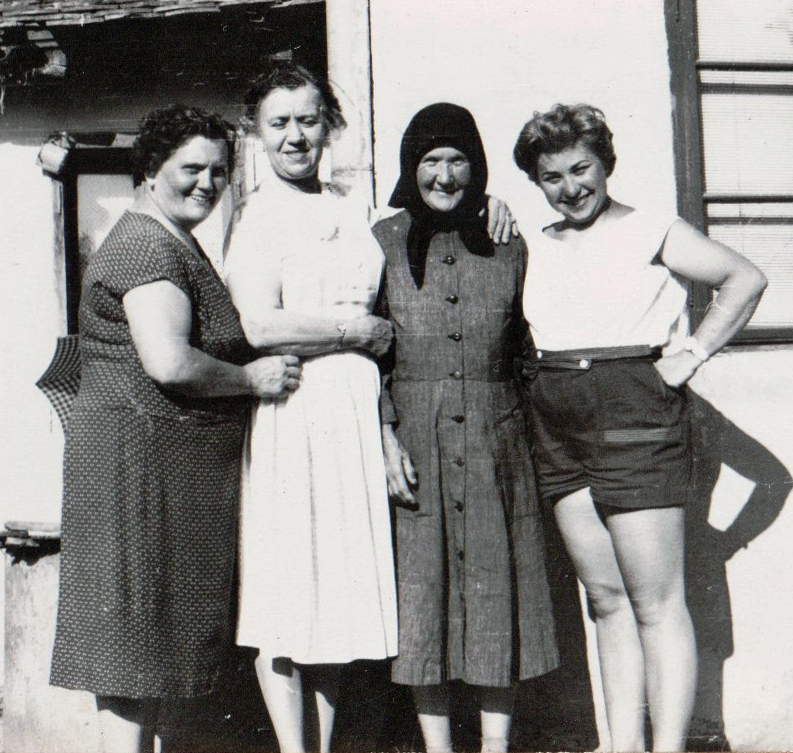 The back of the first photo translated said: “My mother and my two cousins”. Barb and I laughed about that. Didn’t she remember the names of the cousins? Although Great-grandmother Borbála gave birth to 8 babies, Erzsébet was the only one to survive past her 2nd birthday. Erzsébet left for Canada in 1928 to join her husband, our grandfather, who had made the trip a year earlier. Their two little girls, my aunts, stayed with Borbála until they were able to join their parents five years later. When the girls arrived in Montreal they found that they had a new little sister (my mother) and a brother. It’s a common story. When our ancestors left the hardships of the old country for the promise of a better life across the ocean there was almost always someone left behind. Usually the older ones chose to cope with the devils they knew in exchange for the comfort and familiarity of the village where the family had lived as long as anyone could remember. Besides, there was always the hope that their children would come home when life got better at home. 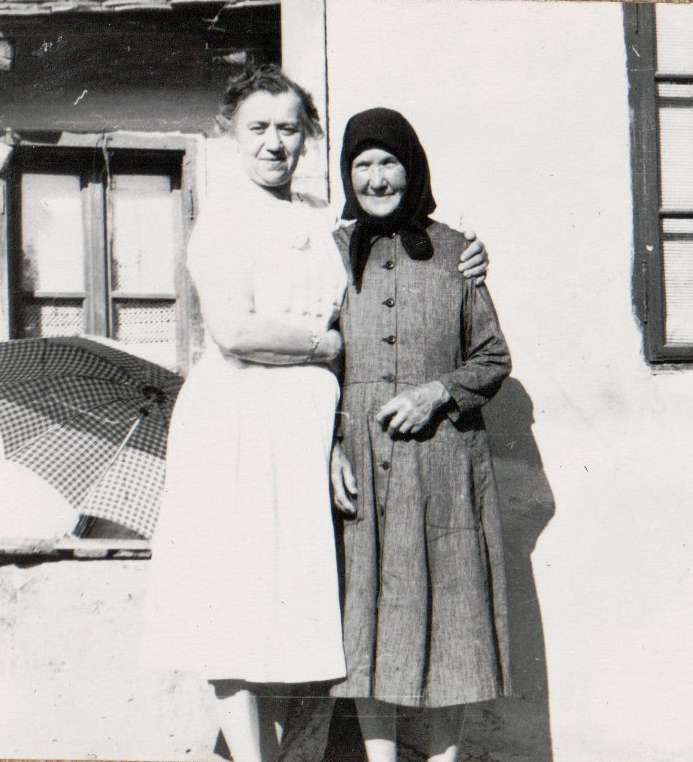 The ubiquitous black kerchief, a fashion staple for women of a certain age in an earlier generation, apparently was still popular in the remote hills of Transylvania. The contrast between Cousin #2’s trendy 1960’s shorts and Great-grandmother’s kerchief is surprising. But what I find most delightful is the radiant smile that renders her beautiful despite her somber outfit. What could make a mother happier than having a beloved child home again? So Cousin Barb promises to go through the album and write in the names of the people she knows. And I will email some of the photos I scanned to other cousins who might be able to fill in some blanks. These photos reminds me of the happy laugh of the grandmother I knew. And now I know the radiant smile of the great-grandmother I never had the opportunity to meet. This entry was posted in 1900s, About the Women, Genealogy, Images, Immigrant Experience, Orbán, Székelykeresztúr and tagged Hungarian Genealogy by edesorban. Bookmark the permalink. So much joy in this story about these ladies and the visit home. I do not know how those old parents did it when their young ones moved across the pond .